Mike Sage-Robinson joined Will and I for the second running of the Ashford Metric Century Gravel Grinder. We got there late due to overnight construction work going in Hartford that was wrapping up and Route 84 was blocked. Mike had us cut through downtown Hartford and I think we made out a little better. NERAC Earth Cycling club, based in the Ashford area, organizes this ride. It was a foggy start at the Ashford Memorial Park but the temperature was perfect. 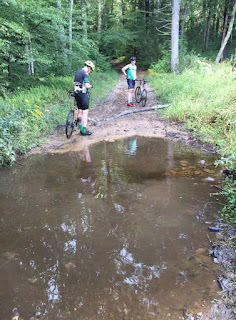 At the pre-ride briefing they mentioned that there would be some big water puddles to go around and a tree blocking one of the roads that you should either go over or under but don't go around. Apparently the route had changed for this year but it started out the same for the first 4 miles. First Dirt was in the middle of Varga Road, a little over 3 miles into the ride. Same as last year. The first big surprise in the different route was cutting through the UCONN Forest on what is essentially a 4x4 track with some monstrous puddles. The mother of all puddles was actually a stream crossing which had crested its banks due to all the rain we had during the past week. One of my feet got wet when I slipped off a rock while trying not to get wet. Will was able to stay dry when he crossed and Mike was no where to be seen. We saw him initially but I think he took the whole shot and was keeping pace with the Hammer Head group. I also saw Bret Metzger, aka The Stunt Monkey, riding a big, blue full suspension, plus size tired mountain bike. 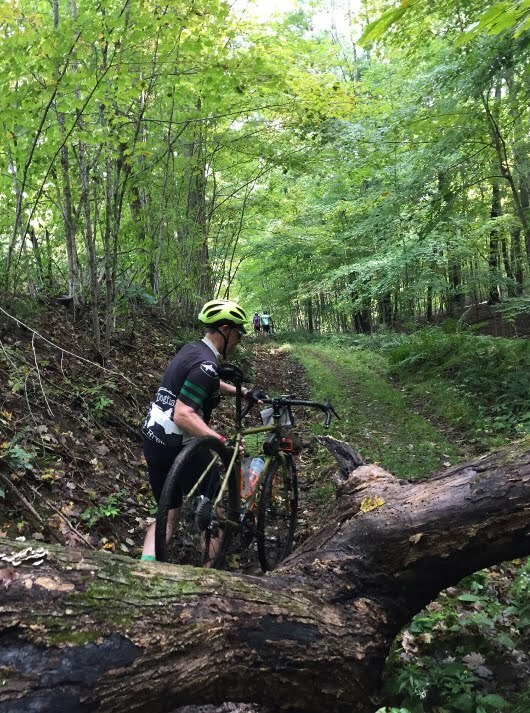 The second surprise with the new route was single track trails in Mansfield Hollow State Park. 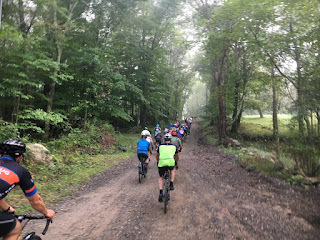 It wasn't bad riding but with all the wet weather it made the roots and rocks really greasy and people were falling all over the place. I don't mind a little single track here and there and this was just the right amount. My preference would have been to ride the dual track rather than the single track, I saw some that we could have rode but didn't know the condition of it. Overall, it wasn't too bad. I had heard that for next year they were planning on more singletrack. That could be a deal breaker if they don't offer a go around. The rest stop at Fenton-Ruby Park is where we caught up to Mke and his friend Tim McGrath (pictured above), who camped out with us at D2R2 last month. After some caloric intake we headed up Burma Road. I have it on my Roubaix to Brew Map but what I didn't know was there were other roads coming off it as well. The ride up Burma Road, and it should be called The Burma Road, was tough. It was rutted and very wet. At one point there was water still running down the one of the tire ruts. 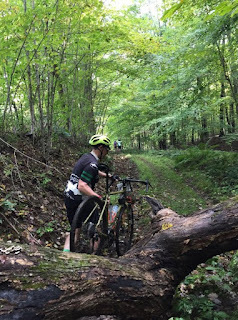 Prior to the ride they talked about this tree that was blocking the road. You had the option of going over it like what Mike, Will and I did, or under it which Tim did. This part of the ride that was totally new as you can see in the following map: Ashford Adventure Rides, and also at the bottom of this post. Mike decided to stay with us after the rest stop. Then we got into this big group of riders, a few of which I have ridden with on previous rides. We lost them after the last big climb before the next rest stop in Union and never saw them again. Someone had a mechanical and yet they still beat us back. I think they didn't stop at the last rest stop. From there, we crossed over Route 84 and rode into Massachusetts. On Union Road, which was just another 4x4 route we came to this puddle. The left side of puddle looked smoother than the right but there was an obscured hole unseen by me due to the stirred up silt. My wheel sank, I stopped short, and went for a swim. My gloves, the other sock, and my kit were soaked. My phone also got submerged but since I had it in a Lifeproof case it was fine. It was tough going on the jeep road that heads south between Boston Hollow Road and Campbell Lane. After crossing, yet another big water obstacle, in which this time I could see the bottom and navigated flawlessly through it, I stalled out on a rough section and scraped up my knee. Got a nice blood trail, too. On the descent to the aforementioned water obstacle Mike caught some air over a rock or a root and ended up flatting his rear tire on the landing so we had to stop and change it. My front rack bag came in real handy on this ride. First of all, I ditched the rear truck bag because I knew I wouldn't be carrying any beer growlers on this ride and it turns out the front rack bag holds everything. The elastic straps on top were great for holding my queue sheet as well as my wet gloves. Nothing beats finishing a ride with a nice, cold PBR!